First off, you will know it by the pine bow above the door. There may never be any additional indicator. Remember that, it is critical. It is an old world signal, maybe a touch 007, a carefully guarded centuries-old remnant in part of this world. Neon signs be damned. When you go to Vienna, and by all means, you should, you will have a great deal to do and little time to do it. You will have to pull yourself away from great music and architecture - not to mention Sacher tortes - to get loose of the city and make your way into the suburbs. And (not that I wish to write your adventure for you), if you are sharp, you will turn up there on or after November 11th of each year and either stay for 300 days or some part thereof, and commit to getting yourself off the beaten path. Tip: If you are on a tour bus, you are already not living the dream... You will and should get lost. You need to come to terms with right this instant. Now then. 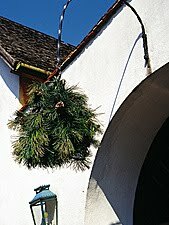 On those lightly beaten path's, truly known well only to locals, you will find heurigers; The vineyard houses belonging to wine producers where new wines are served in the year of their birth. Vienna, until recently when Madrid horned in, was the only metropolitan city that was also a wine growing region. Consequently, when oggling in downtown Vienna, you are never that far from the vine. There is a great deal of imperial-law stickiness involved with heurigers but let's leave it at this: Vienna (Wein) producers may sell wines of the current vintage (For example: Grapes harvested in the fall of 2010 may first be served on November 11, 2010 or anytime for 300 days thereafter and still meet the criteria for "new" in Wein) directly from the vineyard houses, unbottled. 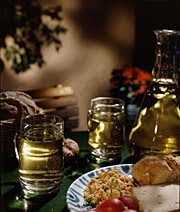 An authentic heuriger will likely not use stemware but very average table water glasses or the like. 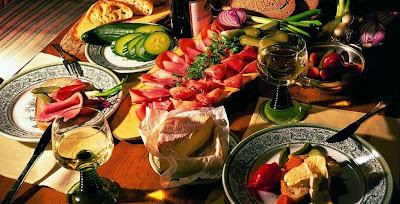 Nothing about a heuriger is precious, so conquer your inner glassware princess before you pull up a picnic bench. These establishments are not licensed as restaurants and in many ways were grandfathered into the Austrian equivalent of the food service governing bureau - gratefully. They serve from a "communal table" or buffet, by law. 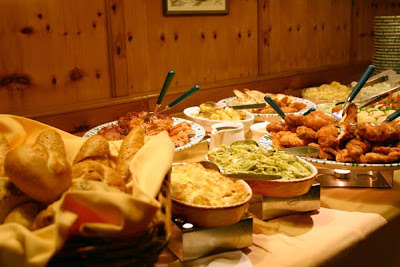 Initially, one had to provide their own food, heuringers in the modern age provide great buffets of local cuisine. In my research I discovered the menu that follows. It's not health food, but look, if you do stay for 300 days, go easy on the meat drippings but remember, you only get one shot at life; balance. Chances are, this menu is incredibly appealing in its home and cooked by experienced hands: I'm in. Smoked bacon and other pork parts cut thickly and served with crusty bread. Sausage; cold, sliced pickled meat, cheese, chopped onions, sour pickles and a Laberl (bread roll). Soft cheese generously spiced with paprika. Small cheese with chopped onions. Ground meat smoked and boiled in a pig's net. Slice of blood sausage marinated in vinegar. Crusty bread spread with meat drippings. Cold, sliced pork with bread. Meat that has been pickled three weeks and then cooked and eaten warm. A spread made of minced sausage and meat. 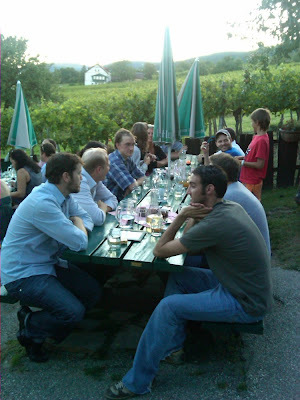 Locals will say the new wines always taste better under an open sky but their DNA has been refining its sensitivity to heuriger since the Middle Ages. I will take it indoors or out although the romanticism of drinking a new wine next to its vines is not lost on me either. Austrian wines, in any environment, are glorious creatures, though I suspect they sparkle just a little more on the palate in a heuriger tasting. Roughly one-third of the regions' wines are blended, both red and white. 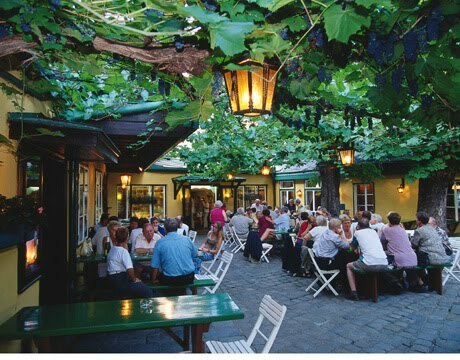 Nearly all of it is consumed within Wein so you will likely need to go in person if you mean to taste them. The vast majority are whites which you may recognize: Gruner Veltliner, Muller-Thurgau, Reisling, Silvaner, Sauvignon Blanc, Pinot Gris, and Chardonnay (though these varietals are labelled with their local names). Reds are just as familiar: Cabernet Sauvignon and Merlot. There is a 300 day "new" period for wines of each vintage as some wines are aged for a period and take months for release versus some of their un-aged counterparts. Conceivably, throughout the newness time frame, you may find yourself back at a heuriger on several occasions to taste new releases of different blends and varietals. Obviously then, like an vineyard or winery, the time not to visit is during harvest and press: September through early November. Create a heuriger on the lawn when spring arrives and serve a pile of gorgeous new local vintages and have a heaping, gorgeous buffet? Once again, not being to precious about anything, which is patently against both the concept and everything Blushing is, anyhow. Put a pine bow on the invitation and one over the door, don't forget. 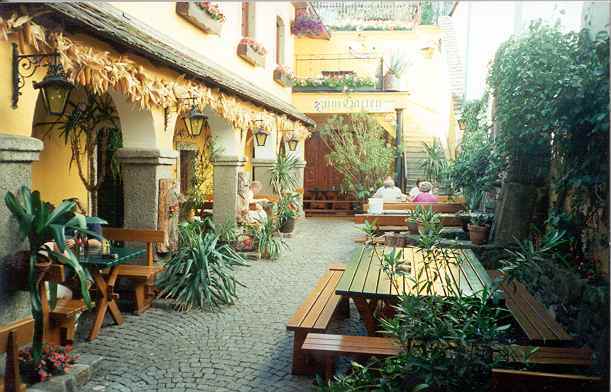 I adore this idea of a Heuriger; thank you for introducing us. It sets my slightly bohemian heart aflutter what with its outdoor setting and communal buffet. Although possibly borderline sacrilege, if one isn't fortunate to live near a vineyard, perhaps they could substitute in a local brew.